Successfully Added IPhone and IPod Deluxe Battery Pack to your Shopping Cart. iPhone and iPod Deluxe Battery Pack lets you charge your iPhone and iPod in a hurry. If you are like most iPhone and iPod users, you just can't get enough of your iDevice. But sometimes the battery can't keep up with you. Now, with this deluxe battery pack, you can give your iPhone or iPod extended life at any time. Snap it onto your iPod for another six hours of music play time on your iPod or another two hours of talk time on your iPhone. This portable little battery pack carries a big charge but still fits comfortably in your pocket. Using this deluxe battery pack is easy. Use your iPod or iPhone's regular USB cable to charge up the battery before you head out. When you're ready to go out, slip this battery pack into your pocket next to your iPhone or iPod. When your iDevice is running low on power, just snap it onto the battery pack. You can now enjoy extra hours of use and fun! Don't miss out on this minimum order opportunity to do some early gift shopping or enjoy an unbeatable low price for resale. Buy more to enjoy even greater discounts on per item cost and shipping. From the home of great factory direct gadgets, Chinavasion. Will this work with my iPhone / iPod? 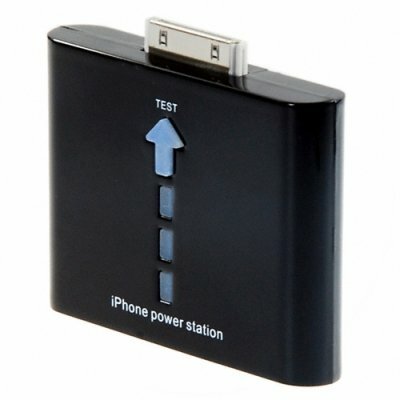 This gadget is compatible with iPhone, iPhone 3G, and all iPod models except the iPod Shuffle.